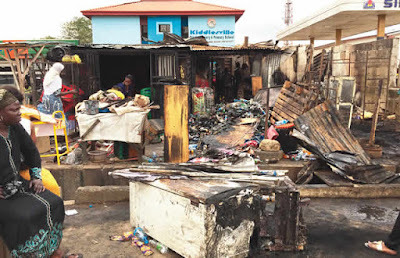 Some business owners in the Ikorodu area of Lagos State have bemoaned the fire which burnt their shops and destroyed goods said to worth millions of naira. The fire, which gutted four shops, started around 2am on Wednesday. The fire was allegedly caused by an electrical spark inside one of the shops on Beach Road, opposite Ikorodu General Hospital, Lagos. An eyewitness, Olamide Ojuope, said the fire occurred after he and his friends returned from an outing. One of the owners of the burnt shops, Biodun Odukoya, said he received a call about the fire from a doctor at the general hospital, adding that his goods were destroyed. It was gathered that another shop owner, Busayo Ayoola, upon seeing that her shop had got burnt, fainted and was rushed to the general hospital. Ayoola later told The Punch that her savings were in the shop. She said, “My blood pressure rose and I was rushed to the hospital. But I have been discharged. I was at the shop on Tuesday and I closed around 8pm. My computers, photocopier, freezers, printer and all the goods I just bought were burnt. Another victim, Idowu Yusuf, a food vendor, said she obtained a loan from a microfinance bank to establish her business, adding that the fire had damaged her trade. She said, “If you go there, you will see the extent of the damage. 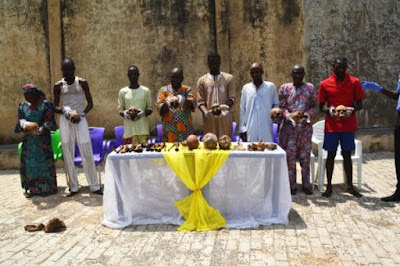 I lost goods worth N500, 000. The Public Affairs Officer, Lagos State Fire Service, Bola Ajao, said the fire service responded immediately it got a distress call on the incident. She said, “We received the call around 3.56am. The Ikorodu station responded immediately. They later called for reinforcement around 4.10am, and our Alausa station joined them.